Just 600 metres from the Potsdamer Platz Entertainment District, this 4-star hotel in Berlin has a striking restaurant with an opening glass roof. It also offers a modern gym and sauna, and stylish rooms with free WiFi. The colourful, air-conditioned rooms at the Mövenpick Hotel Berlin Am Potsdamer Platz feature high ceilings, a flat-screen TV and a cordless telephone. Some rooms face the quiet courtyard. 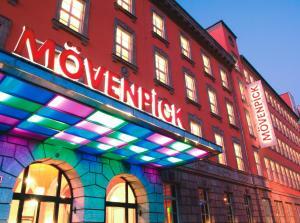 The Mövenpick Hotel's elegant Hof zwei restaurant features a waterwall, and serves Mediterranean and Swiss food. Anhalter Bahnhof S-Bahn Train Station is located directly outside the Mövenpick Am Potsdamer Platz. Direct trains run to the famous Brandenburg Gate in 4 minutes.